This year, the Peralta Community College District will celebrate its 50th Anniversary of serving the community with quality and affordable education. Peralta Community College District was established on July 1, 1964, after residents of Alameda, Albany, Berkeley, Emeryville, Oakland, and Piedmont voted to join in establishing a single community college district. Since opening its doors, Peralta has educated, trained and mentored over one million individuals. Its four colleges – Berkeley City College, College of Alameda, Laney College, and Merritt College – have offered a wide range of programs encompassing the fields that are vital to the Bay Area economy and that have been developed in collaboration with our many community partners to ensure the local needs for a capable workforce can be met. 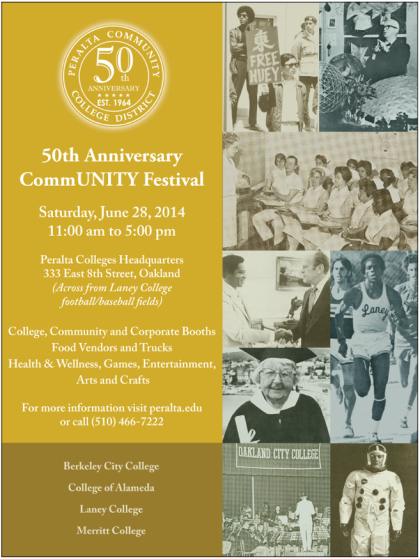 To recognize our collective achievements, Peralta will host a series of events to commemorate its 50th Anniversary. The celebratory festivities begin with a CommUNITY Festival, Saturday, June 28, 2014 • 11 a.m. – 5 p.m. • On the grounds of the Peralta District Headquarters at 333 E. 8th St. • Oakland. We will have a Commemoration Day ceremony, Tuesday, July 1, 2014 • 10 a.m. • In the atrium of the Peralta District Headquarters at 333 E. 8th St. • Oakland. We are proud of our role in providing 50 years of public higher education to the East Bay and beyond and invite you to join with us in celebrating this momentous occasion.